Shaping the ham is an important process during its production, this step acts as a second opportunity to clean off extra fat, and also provides the piece with a better exterior appearance. 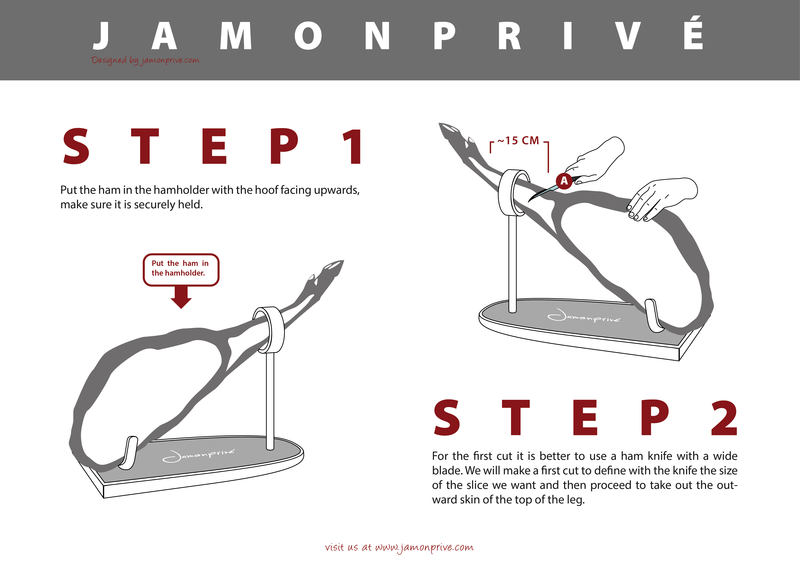 During the ham's processing, each manufacturer has its own way of shaping the ham, although the breed of pig is a determining factor when it comes to the shape of the piece. At the beginning, this process intends to remove parts of the musculature, fat and skin from the exterior part of the piece, giving it the appropriate proportions that are desired for its presentation. We can find different types of hams in all physical and online stores. One of the aspects that can draw our attention is the type of shaping that each ham has received; this is one of the piece's characteristics that quickly grabs our attention. Ham shaping is a process that takes place once the hams have been separated from the rest of the pig's body and mainly consists of removing excess fat and skin from the piece with a knife, in order to protect the product and give it the desired appearance. What is the purpose of shaping? Many people have the idea that the shaping process is carried out in order to improve the appearance of the ham, seeing how it is bevelled in order to be visually appealing. However, the objective is not only to achieve an attractive outside shape but to also review the leg to make sure there are no holes or cracks through which external agents could enter such as dust, insects or any other substance that could contaminate the piece. Aesthetics: through this process, a more attractive appearance is obtained for the outside of the piece. Protection: when cutting the leg to shape it, it's possible to ensure that there are no openings or wounds through which particles or contaminants could enter the piece and damage it. After this process, the pieces come out clean, without any kind of damage. It's important to point out that the pieces never come into contact with the ground and that they are handled in a hygienic setting in order to prevent the introduction of any type of microorganism. What types of shaping exist? Each manufacturer carries out this process in a different way since it directly influences the way each ham is produced. It is one of the defining characteristics that can differentiate the hams. Hams with a V-cut: when the skin goes from the elbow towards the centre of the ham in a V-shape. This cut is the best-known and most common in Spain, it is also called the "Serrano V-cut". The majority of hams are cut this way during the shaping phase. Hams with a beveled or round cut: when all the skin is left on the piece. This is another option we can find, on these hams all of the fat on the piece is covered with skin. This type of shaping is typical in the regions of Teruel and Trevélez, although it can also be seen traditionally in other parts of Spain. Crescent: in this case, as the name indicates, the skin is cut into a half-moon shape. 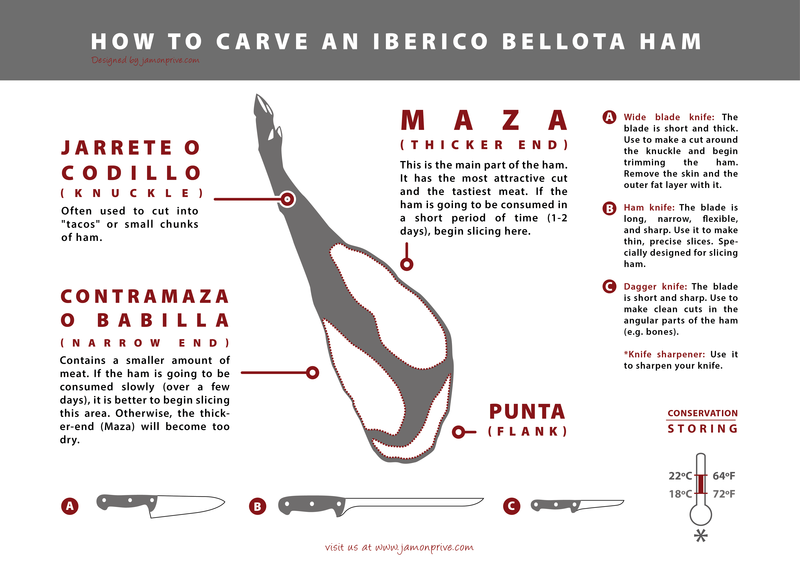 In areas like Huelva, this cut is applied to the shoulder hams, with this profile being very characteristic of the pieces that come from this Spanish municipality. Another aspect that we can find in the market are hams with a cut hoof or "leg". This is characteristic of some areas and the reason why hams are still produced in this way is due to tradition or for reasons of convenience in the warehouse and in the transport of the ham. That being said, any of the types of shaping we've previously described can be found with or without the leg. What other processes are involved with the shape and appearance of the ham? 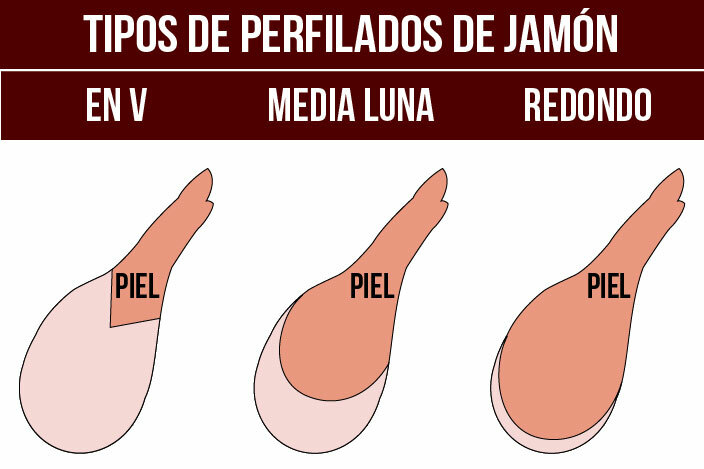 After the shaping phase, the bleeding is carried out, which consists of evacuating the blood from the leg through the application of manual or mechanical pressure. After the bleeding, during the washing the ham is brushed, scraped and massaged, which continues to shape it and eliminates any traces of blood that could be left over in the ham. At this time, expert eyes can evaluate the piece and get a clear idea of what the final appearance will be, taking into account the fact that it is in the remaining processes, especially in the later maturating and ageing stage, when the ham will achieve its definitive appearance.